In “The City” we see, well, the city. We see the jumble of shapes and colors, the snatches of advertisements, the confusion of content that had already become, by the early decades of the 20th century, characteristic of the urban environment. In paintings like “The City,” and in any number of canvases Léger painted in following years, we find a painter coming to terms visually with the new and startling aspects of that urban environment. It makes sense that Léger was startled. He’d been sent off to fight WWI in 1914, like so many other young Frenchmen. The sights and sounds of the Great War pulverized his sensibilities. When he got back to Paris a few years later, his sensibilities were pulverized some more. The city was being lit up and mechanized with all sorts of newfangled devices, just like the battlefields. Léger became fascinated with how Paris looked just after WWI. He realized that a “new look” was emerging, one dominated by commercial design, advertisements, flashing lights, automobiles. Léger, like everyone else, was swept up in these changes. He knew that the new urban space was going to have a huge effect on art. He jumped into aesthetic experimentation right away. Léger designed sets for innovative early works of cinema and for radical experiments in theater. He was influenced by the Modernist architecture of his lifelong friend Le Corbusier. Léger was so excited by new media that he considered abandoning painting altogether and becoming a filmmaker. This fact is usually interpreted as further proof that Léger was primarily interested in capturing, artistically, the dynamism of urban space. 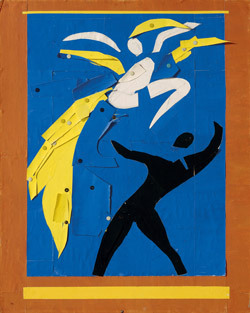 Since painting might not be the best medium in which to do that, Léger considered a move to film. 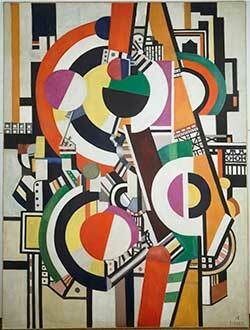 But Léger did not, in the end, abandon painting. Sotaking Léger’s lifelong commitment to painting seriously is a good place to begin the project of rescuing Léger from sociology. We are always looking at Léger’s paintings to find out what they have to say about the city. But what if we turn the question around? What if we ask what the city has to offer painting? 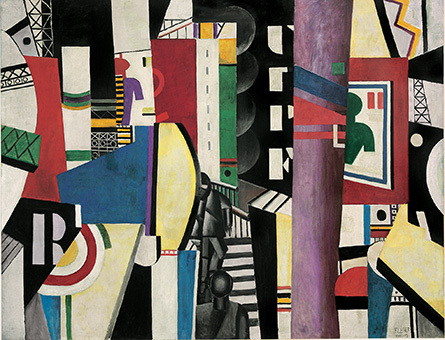 Look at Léger’s “The City” again. If we’ve already convinced ourselves that the painting is about urban dynamism and change, it looks that way. But what if the painting is about stability and balance? Notice how the entire canvas of “The City” is completely filled up. The center of the painting is not more important than the left corner or the top middle. You must look at the whole painting at once, or not at all. The purplish column to the center right of the column creates a central anchor. But it isn’t the “subject” of the painting. “The City” is not “about” the purplish column. It is “about” the entire scene. Every color and shape in the painting works toward the total look of it. It is unified and equal. When you think about the balance and the unity of the canvas, “The City” bears comparison to the paintings of Peter Paul Rubens. Take Rubens’ “The Four Continents.” It was painted about 1612. The painting is an allegory of the relationships between the continents of Europe, Asia, Africa, and America. But putting the allegorical meaning aside, the painting is almost literally about space, the way that the continents hold together in order to create a world. In typical Rubens style, the painting is a unity of color and form. Every part of the painting fits in with every other part of the painting. There is nothing in the painting that is just there. Look at the arms and legs at the outer edges of the painting for a little while. Do you notice how all the limbs are either interlocked or indirectly connected to the others? Our eye goes from outstretched arm, to draped hand, to alligator tail, to tiger paw, and so forth. Each limb is distinct and self-contained. But it is also connected to the whole. Organizing the shapes and colors on a canvas in this distinct but unified way is not an easy thing to do. It’s one of the central problems of making a painting, whether you’re making an allegory of the four continents, or presenting an urban tableau. Let’s assume for a moment that Léger remained, throughout his life, interested in this painterly problem of organizing shapes and colors into a coherent whole. WWI and the new Paris may have shaken him up, but once he had sorted himself out a bit, once he’d taken a couple of years to reflect on his new environment, maybe he began to look at his surroundings again with a painter’s eye. Maybe, when Léger looked out at the visual scene presented by a typical Parisian street in 1919, he saw paintings. The scenes on those streets were dynamic and chaotic, for sure. Big cities are like that. But Léger was not a journalist. He wasn’t making documentaries. He was painting. By 1919, Léger looked out onto the streets of Paris as a painter and he saw organization. Not chaos, but organization. He found himself confronted by a complete and integrated visual field. The visual organization of urban space looks different than what you’ll find in untrammeled nature. Léger wondered whether he could paint this difference. Notice that there is no sky or ground or river or horizon line in “The City.” All of the elements that would orient the scene in, say, a 19th-century landscape painting by someone from the Barbizon School are absent in Léger’s painting. Look at almost any painting by Millet and you’ll see the crucial elements: the sky, the field, the river, the trees, the peasant. These are the formal elements that a 19th-century landscape painter must contend with. The trick is to make those natural elements hold together. The peasant standing in the middle of the field in a Millet painting is standing in the middle of a coherent visual world. The peasant fits perfectly into that world, and that world is made more perfect by the presence of the peasant. Does the visual field of urban space present its own kind of organization? Léger’s answer was yes. An emphatic yes. As Léger experimented with painting cityscapes in different ways, he began to realize that the otherwise disorienting jumble of shapes and colors in an urban tableau is particularly well suited to the medium of painting. Cityscapes have an inherent “flatness.” There is so much going on right in front of you that you tend to notice depth less. How can you look down the street when you can barely sort out the crowded visuals right in your face? Urban scenes are thus already like formal studies in the arrangement of shape and color. Just looking at them is like making little paintings in your head. You don’t “look into” a scene in a metropolis so much as “look at it.” But the history of painting for hundreds of years before Léger was one of “looking into.” The early Renaissance masters spoke about paintings as “windows.” Think of a painting, they said, as a window into reality. New mathematical models discovered in the 15th century allowed these painters to create a sense of depth and distance that had never been possible before. Looking at a painting by a great Renaissance master really can seem like looking out of a window and seeing, say, the rolling hills of Tuscany on a beautiful summer evening. It is amazing that painters learned how to do this. But you could also call it an illusion, even a form of lying. Paintings that make you see depth and distance and three-dimensional space on a two-dimensional surface are engaged in tricking the eye and the mind. The window into reality is not real. It is a kind of simulation. By the end of the 19th century, many painters had lost faith in this kind of illusion making. That same loss of faith happened to Léger. That’s why he considered a switch to film. 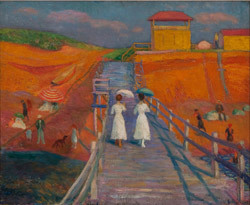 But he rediscovered his faith in painting by realizing that painting had become relevant to the new visual world of big modern cities. 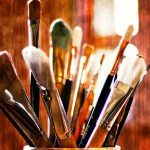 This change was fortuitous for paintings since paintings, being flat surfaces, have a natural love of surface. The arbitrary jumble of shapes and colors in any cityscape is a surface with its own logic. And the arbitrary rectangular shape of a canvas is a good surface for working out the internal logic of blocks of shape and color. This was a new opportunity for painting to be true to itself (shapes and colors on a flat surface), while remaining true to the actual scene being painted (jumbles of shapes and colors in a cityscape).